Vendor-related KPIs are a tool to measure business efficiency, performance, and productivity as well as assess or trim the vendor base. The Supplier Performance Indicator comes from the combination of KPIs that have to do with efficiency and capacity of suppliers. Efficiency is expressed by timeliness and productivity, while capacity is expressed by the ratio between a supplier’s average throughput and the DIFOT (Delivered In Full, On Time) rate or by the FPY (First Pass Yield) rate. 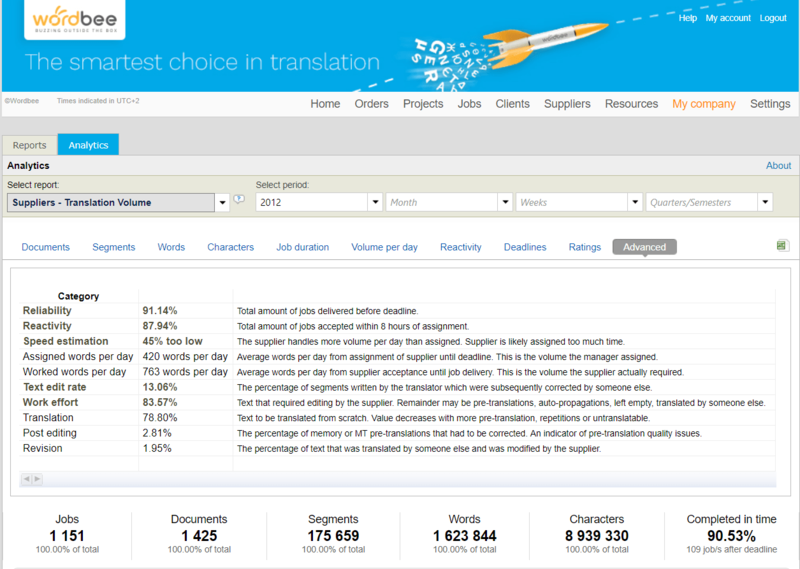 These indicators can be derived from the statistics that Wordbee users can find in the Statistics tab in the Summary item of the My company menu. 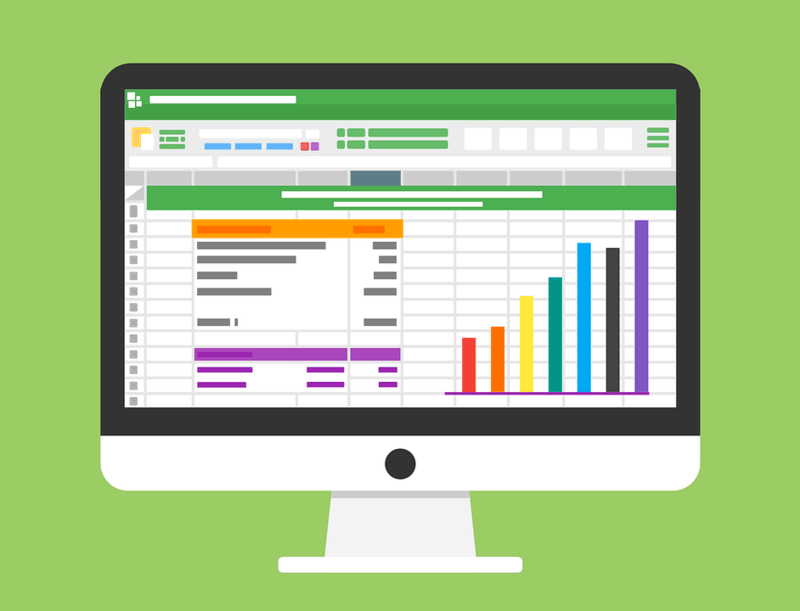 As a tool to measure business efficiency, performance, and productivity, assessing a supplier’s capabilities can be very helpful to streamline processes related to vendor management, project management and, ultimately, quality management. The number of Jobs completed on time clearly signals a supplier’s reliability, while the average Job acceptance time signals a supplier’s readiness (Reactivity). Both are indicators of productivity. The Daily worked volume and the Segments requiring correction options signal a supplier’s capacity. All of these statistics will allow you to get insights on process and staff efficiency, for example through the average measured interval between the inquiry and the acceptance of job assignments. Also, you might evaluate a supplier’s capacity through the percentages of jobs delivered before and after deadlines. Based on the information collected through the Statistics dashboard, actions can be taken to improve performance. The percentage of Jobs completed on time is an indicator of efficiency and timeliness. With the Average completion option, you may be able to determine if it’s possible to further compress deadlines and increase competitiveness. In this respect, the latter should go together with the Job acceptance time option. You may also find it useful to know a supplier’s productivity, as expressed through the Daily worked volume under Capacity. From a vendor-management perspective, DIFOT (Delivered In Full, On Time) indicates how frequently projects are being delivered at the expected time and how complete they are when they’re delivered. Therefore, this gives a measure of a supplier’s reliability. 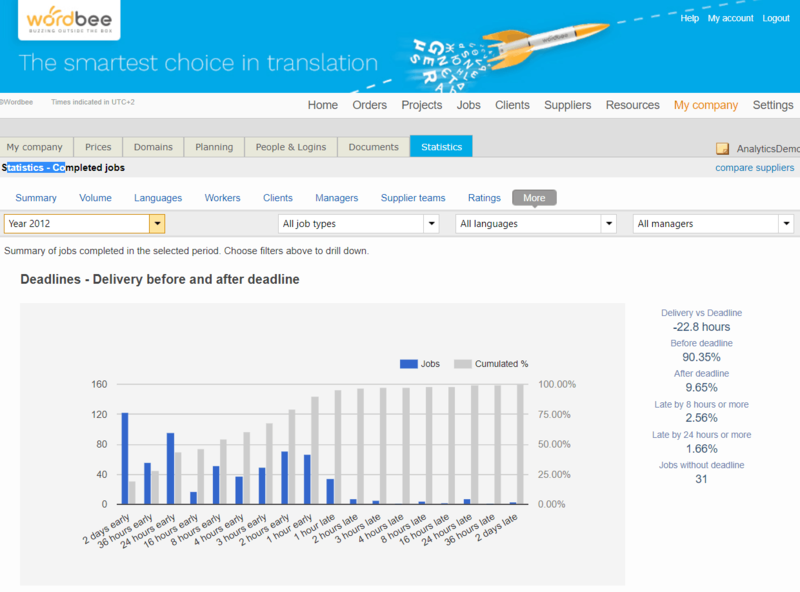 This information can be derived from the Deadlines - Delivery before and after deadline dashboard. Deviations from a pre-set standard might suggest that some actions are needed either to improve the supplier’s productivity or to further investigate the supplier’s capability. You might consider using the Supplier Performance Indicator to try and trim the time from proposal to order, the time from proposal to assignment, and finally, the time from assignment start to completion. You may also use the total number of jobs accepted within 8 hours of assignment as a measure of Reactivity. From the Speed estimation option, you might also estimate if a supplier handles more volume per day than assigned, whether you might assign extra work to your supplier, or whether they are being assigned too little time. Estimates might be substantiated by the Assigned words per day and the Worked words per day measures. Finally, you might also want to exploit Wordbee’s option to customize reports to gain different perspectives on your data.